It seems everyone is interested in meditation…talking about the wonderful benefits, recommending classes and discussing the different ways to “do it”. But, for a beginner, just what is “it”? And how do you do “it”? Our busy, hectic, lifestyles may seem to prohibit this peaceful practice, or provide a convenient “excuse” not to begin, or continue, to meditate…but, the happy news is, you CAN successfully benefit even if you practice for short periods. With the simple technique described below, you will begin and incredible journey. There are 100’s of styles, traditions and forms of meditation, but this simple practice has always been highly recommended. It is said, “Here is where the beginner begins and the Master ends”. Sit comfortably, preferably upright and alert. If unable to sit upright, lie down. When sitting, allow your spine and back muscles to support you, if you’re able, otherwise use the back of the chair. Especially for beginners, if you’re uncomfortable, your mind will be distracted and you will not benefit fully — it will distract you from your process. You may alter things for your needs. If sitting in a chair, feet flat to the floor, thighs parallel to floor, feet aligned with knees, knees aligned with hips and shoulders, back straight (but not rigid), hands resting in lap, palms down. Do not slump or slouch — imagine your head suspended by a golden thread from above. The suspension point is the crown of your head, so your chin is slightly tucked inward. If you slump or tire, just pull your sting upward! You’ll feel weightless and relaxed. Remember, alter your position somewhat if needed. You will slowly become very comfortable with this position. To sit on a mat, cushion or pillow, sit cross-legged, half or full lotus, depending on your ability. 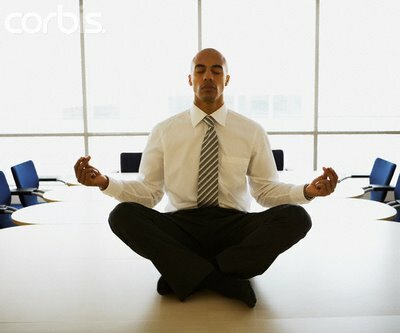 Do not force this, or any other posture; move gradually into it. Whether practicing indoors or outdoors, the air should be fresh and well-ventilated, without draft or high wind and clothes should be loose and comfortable. You may close your eyes (unless this causes you to fall asleep) or gaze with almost-closed eyes as if looking downward and inward. If you wish, rest the tip of your tongue on your upper hard palate behind your teeth. Unless there is a physical restriction, breathe through your nose. Traditionally, the best times to practice are upon arising and in the evening or before bedtime. With hectic modern schedules, any time is fine. Don’t allow a “lack of time” to stop you. You can still benefit even if you practice for “odd moments” throughout your day — you will be surprised how a few minutes here-and-there add up for your peace of mind. Recommended practice time is 20 minutes, twice per day — IF YOU CAN … some people practice more often and for more than 20 minutes. Remember, this is personal; just do your best and enjoy. Do not practice when exhausted; avoid eating 30 minutes before or after practice. Practice for a few minutes at first in a quiet environment. The time will lengthen as you become more comfortable…you’ll probably surprise yourself! You may use soothing music as a pleasant background. Sit comfortably…allow yourself to become aware of your environment as you gently and slowly close your eyes…become aware of your body…feel yourself sitting…feel the contact your body makes with each surface…feel body parts touching other body parts (hands resting in lap, legs crossed)…feel your body resting comfortably and safely in the surrounding air…draw your awareness inward as you feel your body relaxing into the surfaces…calmly be aware of your breathing, without altering your breath…rest your attention either at your navel or your nostrils…calmly feel and be aware of the rhythm of your breathing…if thoughts come into your mind, don’t try to stop or avoid them; just be aware of them and let them drift away — don’t follow them and don’t try to solve problems…thoughts will always come; just smile as you notice them…observe them and let them go as you return to awareness of the soothing flow of your breath…always, as your mind wanders, bring it back to your breathing…You may wish to imagine or think of your breath as a color or a light or a pleasant thought moving in and out of your body in a smooth flow — words like “peace”, “calm”, “tranquility”, “love”, “light”, “safety”, and the like are fine…use whatever you wish…you may repeat such words in your mind in rhythm with the flow of your breathing…smile inwardly as you meditate…just sit and listen to your breath and the calming thoughts…be aware…rest in the stillness and silence of this peaceful, powerful moment…and for just this moment, you can release all thoughts, worries and concerns and just be tranquil and serene. When you feel that you have practiced for just the right amount of time, slowly return to awareness of your body…awareness of being in your environment…turn your attention outward and slowly, gradually open your eyes. You may stretch and/or rub your palms together, place them over your eyes, then rub gently down your face and back of head and neck several times. Then simply proceed with your normal activities. Meditation is a cultivation process — be patient and natural, enjoy each moment, do not “try hard”…just allow and everything will naturally fall-into-place. The biggest blocks to meditation are impatience and expectations. Just continue to repeat the simple process and you Will benefit. Don’t wait for or desire “spectacular” results; that is a distracting disturbance…in fact, if you can keep from doing that, THAT is spectacular! Don’t be impatient with yourself or disappointed if today’s practice wasn’t as good as yesterday’s practice…that happens! Just rest for a moment…ssshhhh…rest in the stillness and silence, and enjoy! The purpose of meditation is to make our mind calm and peaceful. If our mind is peaceful, we will be free from worries and mental discomfort, and so we will experience true happiness; but if our mind is not peaceful, we will find it very difficult to be happy, even if we are living in the very best conditions. If we train in meditation, our mind will gradually become more and more peaceful, and we will experience a purer and purer form of happiness. Eventually, we will be able to stay happy all the time, even in the most difficult circumstances. Usually we find it difficult to control our mind. It seems as if our mind is like a balloon in the wind – blown here and there by external circumstances. If things go well, our mind is happy, but if they go badly, it immediately becomes unhappy. For example, if we get what we want, such as a new possession or a new partner, we become excited and cling to them tightly. However, since we cannot have everything we want, and since we will inevitably be separated from the friends and possessions we currently enjoy, this mental stickiness, or attachment, serves only to cause us pain. On the other hand, if we do not get what we want, or if we lose something that we like, we become despondent or irritated. For example, if we are forced to work with a colleague whom we dislike, we will probably become irritated and feel aggrieved, with the result that we will be unable to work with him or her efficiently and our time at work will become stressful and unrewarding. Such fluctuations of mood arise because we are too closely involved in the external situation. We are like a child making a sandcastle who is excited when it is first made, but who becomes upset when it is destroyed by the incoming tide. By training in meditation, we create an inner space and clarity that enables us to control our mind regardless of the external circumstances. Gradually we develop mental equilibrium, a balanced mind that is happy all the time, rather than an unbalanced mind that oscillates between the extremes of excitement and despondency.